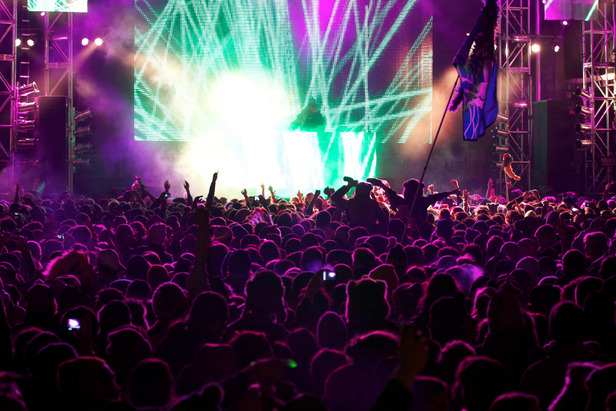 NYE Parties: SnowGlobe, South Lake Tahoe, Calif.
Don't expect to relax at SnowGlobe. The party is one of South Lake Tahoe's best. There are few ski towns in North America that can put together a true festival in the middle of the winter. South Lake Tahoe can. This town has been home to massive Phish fests, major rock concerts and now the burgeoning SnowGlobe, a second-year electronic music gathering that culminates on New Year’s Eve. It is three days of glow sticks, drinking and dancing, followed by waking up way too early to ski, then repeating the next night. More than 40 DJs and bands will take the outdoor stages with a line up that includes Deadmau5, Wiz Khalifa, Chromeo, Beats Antique and Big Gigantic. A VIP ticket includes access to an indoor (read, heated), open premium bar (read, OPEN!). Might be worth the upgrade for those who plan on drinking more than a few cocktails over the course of the night and/or three days—and for those who just want to stay warm. $150 for 3-day pass ($450 for VIP). NYE Parties: Couloir, Teton Village, Wyo. NYE Parties: Big Picture Theater, Waitsfield, Vt.
NYE Parties: Red Lion, Vail, Colo.